Fuel Level - Hero MotoCorp Ltd. Ensure sufficient fuel is available in your fuel tank for your journey. Check for leaks. The approximate amount of fuel quantity available in the fuel tank is indicated by the number of segments in the display/Fuel gauge meter in the console. If only one segment is displayed above the red mark/If the needle reaches the red mark in the fuel gauge meter, this indicates that the fuel quantity is low and the fuel tank should be refilled as soon as possible. The three-way fuel valve is on the left side of the carburetor. 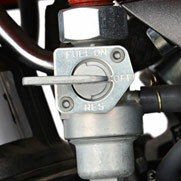 OFF - At "OFF" position fuel cannot flow from the tank to the carburetor. Turn the valve "OFF" whenever the two-wheeler is not in use. 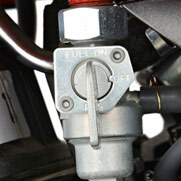 ON -At "ON" position fuel will flow from fuel tank to the carburetor. RES -At "RES" position fuel will flow from the reserve fuel supply to the carburetor. Use the reserve fuel only when the main supply is exhausted. Refill the tank as soon as possible after switching to "RES" position. The reserve fuel supply is specified as per our model. Do not operate the two-wheeler with the fuel valve in the "RES" position after refilling, you may run out of fuel, with no reserve. Do not keep the fuel valve between "ON" and "OFF" position while riding, since this may drain reserve fuel from the tank. Do not park the motorcycle under direct sunlight as it causes evaporation of petrol due to heat and deterioration of paint gloss due to ultra violet rays. Petrol is extremely flammable and is explosive under certain conditions. Refill in a well ventilated area with the engine stopped. Do not smoke or allow flames or sparks in the where the petrol is refilled or where the petrol is stored.